Which candidate will emerge from the crowded Republican presidential field next year? Can anyone stop or at least slow down Hillary Clinton's seemingly inevitable march to the Democratic nomination? Will Democrats be able to match the GOP in Super PAC spending? And will there be new revelations about Clinton's e-mails or the Clinton Foundation's fundraising practices? Regardless of whether the Republican nominee is Jeb Bush, Scott Walker, Marco Rubio, or one of the longer-shots in the GOP field, regardless of how many delegates Bernie Sanders or Martin O'Malley manage to win in the Democratic caucuses and primaries, regardless of any new Clinton e-mail or fundraising controversies, and regardless of how many millions of dollars are spent by conservative and liberal Super PACs, the basic contours of the presidential race will not be affected. The 2012 election saw the highest levels of party loyalty and straight-ticket voting since the American National Election Studies began tracking American voting patterns in 1952. Over 90% of Democrats and Republicans, including voters who claimed to be independents but indicated that they leaned toward one party or the other, supported their party's presidential candidate. Close to 90% supported their party's House and Senate candidates as well, and 83% cast a straight-party ballot for president, House, and Senate. Over the past several decades, partisan identities in the United States have become increasingly aligned with other salient social, cultural, and political divisions in American society. Supporters of each party have come to perceive supporters of the opposing party as very different from themselves in terms of their social characteristics, political beliefs, and values, and to hold strongly negative opinions of the opposing party's elected officials, candidates, and supporters. Negative perceptions of the opposing party are also reinforced by exposure to partisan news sources, which have proliferated in recent years. The results displayed in Figure 1 show that party supporters' ratings of their own party have changed very little over this time period. The average rating by voters of their own party went from 72 degrees in 1980 to 70 degrees in 2012. In contrast, voters' feelings toward the opposing party have fallen sharply over this time period. The average rating of the opposing party fell from 45 degrees in 1980 to 30 degrees in 2012. Moreover, this increasing negativity toward the opposing party affected all types of party supporters. Between 1980 and 2012, the mean rating of the opposing party on the feeling thermometer scale fell from 41 degrees to 24 degrees among strong party identifiers, from 47 degrees to 36 degrees among weak party identifiers, and from 48 degrees to 35 degrees among leaning independents. For a growing percentage of American voters, negative feelings toward the opposing party outweigh positive feelings toward their own party. Moreover, most of this change has occurred since 2000. 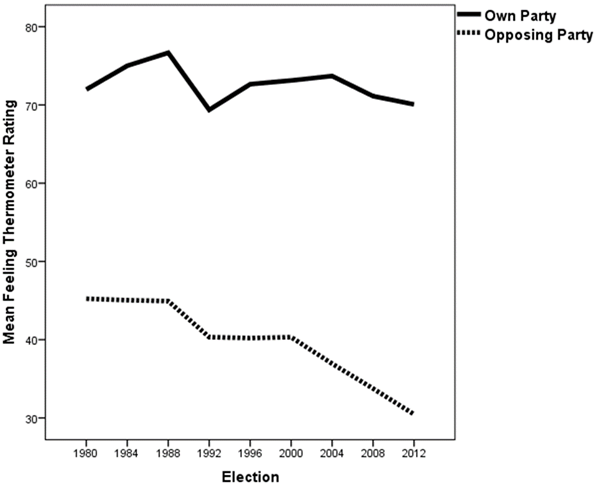 Between 2000 and 2012 the proportion of positive partisans -- voters who liked their own party more than they disliked the opposing party -- fell from 61% to 38% while the proportion of negative partisans -- voters who disliked the opposing party more than they liked their own party -- rose from 20% to 42%. This was the first time since the ANES began asking the party feeling thermometer question in 1978 that negative partisans outnumbered positive partisans. The rise of negative partisanship has influenced feelings about the Democratic and Republican presidential candidates as well. In 1980, 52% of voters gave the opposing party's presidential candidate a neutral or positive rating, while only 36% gave the opposing party's candidate a rating of 30 degrees or lower. In 2012, in contrast, only 25% of voters gave the opposing party's presidential candidate a neutral or positive rating while 60% gave the opposing party's candidate a rating of 30 degrees or lower. Negative partisanship has been a major contributor to rising levels of party loyalty and straight-ticket voting in recent elections. According to ANES data, in 2012 only 52% of party supporters who rated the opposing party above 50 degrees on the feeling thermometer voted consistently for their own party's candidates in the presidential, House, and Senate elections. But this group made up only 10% of party supporters. In contrast, 87% of party supporters who rated the opposing party below 50 degrees voted consistently for their own party's candidates, and this group made up 74% of party supporters. We can predict with a high degree of confidence that party loyalty will be very strong in next year's elections. The rise of negative partisanship means that very few Republicans or independents who lean toward the Republican Party will vote for Hillary Clinton or any other Democratic presidential candidate in 2016. Likewise, very few Democrats or independents who lean toward the Democratic Party will vote for Jeb Bush, Scott Walker, Marco Rubio, or any of the other potential Republican candidates. “Pure independents,” voters with no partisan preference at all, will probably make up less than 10% of the electorate, and if 2016 is like other recent elections, they will end up splitting their votes fairly evenly between the parties. Strongly partisan voting patterns mean that we can expect another relatively close election in 2016 with the same set of swing states 1 as in 2012 ultimately deciding the outcome. But they also mean that, given a normal presidential election turnout pattern, the Democratic nominee should have a slight edge simply because voters who identify with or lean toward the Democratic Party will probably outnumber voters who identify with or lean toward the Republican Party. According to a recent study 2 by the highly respected Pew Research Center based on more than 25,000 interviews with eligible voters, during 2014 Democrats and independents leaning toward the Democratic Party outnumbered Republicans and independents leaning toward the Republican Party by a margin of 48% to 39%. While the Democratic margin is likely to be somewhat smaller among actual voters than among eligible voters, it should still be large enough to give the Democratic candidate an advantage. Moreover, the Democratic margin in leaned party identification could be pushed up a bit by the expected increase in the nonwhite share of the electorate between 2014 and 2016. In the House elections, Republicans have a significant advantage 3, partly due to the inefficient distribution of Democratic voters across districts. Democratic voters are heavily concentrated in a relatively small number of districts in large urban areas, which is partly due to gerrymandering by Republican-controlled state legislatures following the 2010 midterm elections. As a result, there are considerably more Republican-leaning districts than Democratic-leaning districts in the nation. In 2012, for example, even though Barack Obama won the national popular vote by about four percentage points, Mitt Romney actually carried 227 House districts to only 208 for Obama. This GOP advantage in district partisanship, combined with the strongly partisan voting patterns in House elections, means that even if Democrats hold the White House in 2016, they are unlikely to pick up enough seats to regain control of the House 4. Alan I. Abramowitz is the Alben W. Barkley Professor of Political Science at Emory University and a senior columnist for the Crystal Ball. His most recent book is The Polarized Public: Why American Government Is So Dysfunctional. Follow Alan on Twitter @AlanIAbramowitz 5. Steven Webster is a Ph.D. student in the Department of Political Science at Emory University. His research interests include American voting behavior, campaigns and elections, personality and politics, and political psychology. Follow Steven on Twitter at @stevenwwebster 6.